The Moen Renzo one-handle kitchen pullout faucet has a spray handle that pulls out to clean hard-to-reach areas, pots and pans. 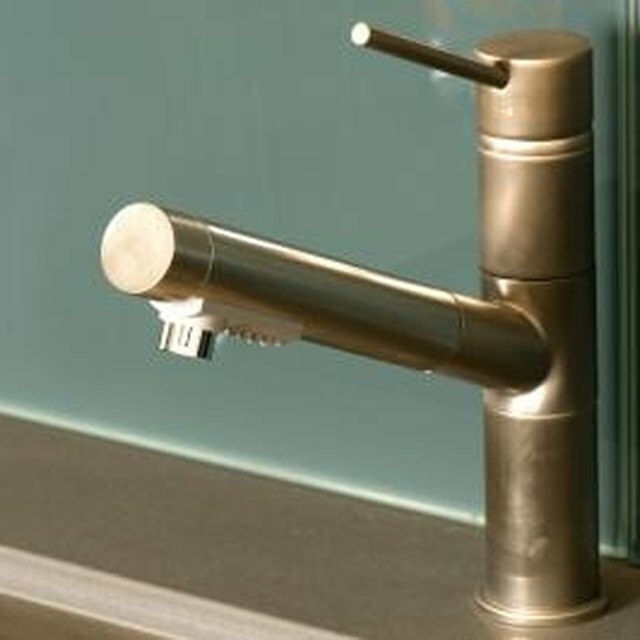 This faucet still uses a cartridge-style insert inside the body of the spout, which contains valves to control water flow. When the parts in the cartridge wear or split, replacing it is the only way to fix the faucet. You do not need special plumbing knowledge to complete this quick fix. Close the valves on the pipes below the faucet. Take off the handle by pulling out the small plug in the front of the handle. Remove the screw under this plug with an Allen wrench then pull up on the handle. It slides off the cartridge stem when the screw is removed. Remove the dome, the part under the faucet's handle, by turning it to the left. Turn and remove the spout assembly, and then remove the nut securing the cartridge to the faucet body. Use pliers to loosen this part if it will not remove by hand. Insert the new cartridge into the faucet and press it into place. Replace the cartridge nut and tighten it securely with pliers. Replace the dome and handle. Attach the handle by inserting and tightening the screw with the Allen wrench.